Vaccination Schedules in Australia | Australian Vaccination-risks Network Inc.
Australia conducts an aggressive vaccination program – far more aggressive than many nations in the world. A child born today will receive 49 vaccine doses by the time they reach adulthood, when the standard schedule has been followed to the letter. This rises to to 67 when the recommended (but unfunded nationally) annual Influenza for children aged 6 months to 18 years is included. Indigenous and medically-at-risk children will receive even more. See tables below. See 1960, 1975 and 1996 schedules further down the page, for comparison. The following tables are based on the National Immunisation Program Schedule. 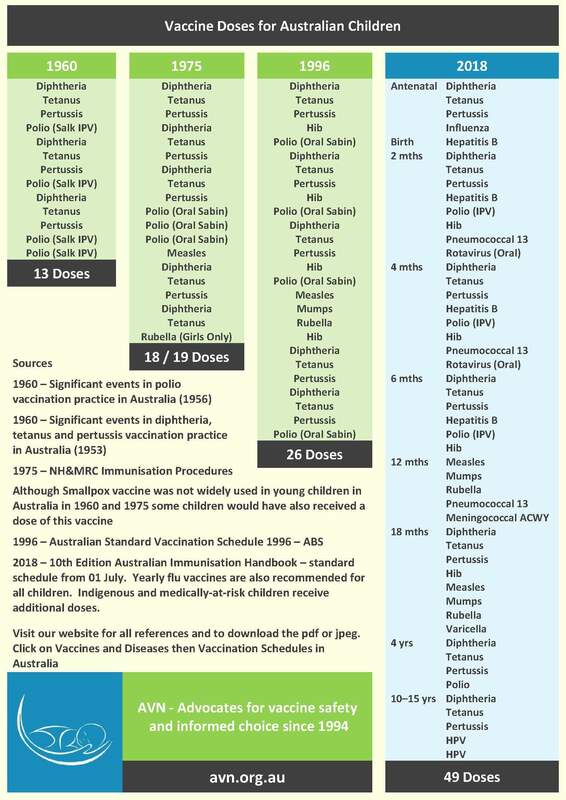 In addition to the standard schedule above, the vaccines listed in the table below are also funded for Aboriginal and Torres Strait Islander children under the National Immunisation Program. In addition to the schedules above, some additional vaccines are funded for medically at-risk children under the National Immunisation Program. For example, extra Pneumococcal vaccines. See the section called Vaccination for Special Risk Groups in the Australian Immunisation Handbook for further details. State and territory health departments also fund some additional vaccines not funded under the National Immunisation Program. For example, Influenza vaccines for pregnant women. See links to state and territory health departments below. In 1960, there was not a national vaccination schedule as such. According to the National Centre for Immunisation Research and Surveillance (NCIRS), children are likely to have received 13 vaccine doses as shown in the table below. As you can see in the table below, in 1975, children received 18 vaccine doses up to the age of 6 years. Vaccination started at 3 months of age, and children were not given more than 3 doses at a time. Although Smallpox vaccine was not universally used in young children in Australia in 1960 and 1975 some children would have also received a dose of this vaccine, depending on where they lived, and if they travelled overseas. It is difficult to determine just how widespread Smallpox vaccination was in Australia during these periods. According to federal Hansard from 1959, Smallpox vaccine was made available by the Commonwealth free of charge to state health authorities. How the campaign is conducted, and what use is made of the vaccine after that, are matters for arrangement by the local authorities concerned, and are no concern of the Commonwealth. According to federal Hansard from 1965, no cases of Smallpox had been recorded in Australia for 27 years, and quarantine measures were in force at that time. Nobody can enter Australia by air without producing a current international certificate of vaccination or without undergoing a period of quarantine. At this time, Australians going overseas were also strongly advised to be vaccinated against Smallpox as were those Australians who work in occupations which bring them into regular contact with overseas travellers are encouraged to be vaccinated. The 1975 NH&MRC Immunisation Procedures recommended that, when used, primary vaccination against Smallpox should commence between one and four years. * Children who received the HibTITER vaccine received 4 doses while those who received the PedvaxHib vaccine received only 3 doses. Please feel free to download and share our poster called Vaccine Doses for Australian Children. It highlights the significant increase in the number of vaccine doses a child born today will receive relative to previous generations. Right click image below to “Save As Image”. Size is suitable for Facebook. Download Vaccine Doses for Australian Children (pdf). Is the general health of our children worsening rather than improving? Autoimmune and neurological disorders have been increasing significantly from the 1990’s to now. Why is this? “For the first time in over a decade the federal government is releasing new data on the number of children with developmental disabilities, reporting that diagnoses have grown significantly since the 1990s. “Key findings. In 2007, approximately 3 million children under age 18 years (3.9%) were reported to have a food or digestive allergy in the previous 12 months. From 1997 to 2007, the prevalence of reported food allergy increased 18% among children under age 18 years. Children with food allergy are two to four times more likely to have other related conditions such as asthma and other allergies, compared with children without food allergies. Note: See Definitions for an explanation of reported food allergy. My baby was given the Vitamin K injection and the Hep B vac while I was incapacitated straight after her birth,even though I had signed a form saying no to both. I am furious to say the least. Has this happened to any one else and what did you do? Any advice on minimising any ill effects physically? And I’m not saying that I will always approve comments such as yours Matty. I just want people to be aware of the calibre of our opposition and the level of their ability to debate. My son is not vaccinated. He is 16 and is interested in studying a Tafe health care course that requires him to be fully vaccinated. We are both concerned about the effects being vaccinated will have on his health but he is serious about studying this course. Just wanted some info please; will the vaccines be less dangerous because he is 16? What can we expect when he is vaccinated at 16 after never having been vaccinated? Thank you. Lisa, I can’t give you medical advice nor can the AVN. I suggest that you speak with health professionals and get copies of the package inserts for each vaccine that is recommended for your son. Look at the list of known side effects and ingredients and that will give you a better idea. Reactions can occur at any age. All health care workers should be vaccinated as they have responsibility and a duty of care to the people they treat.